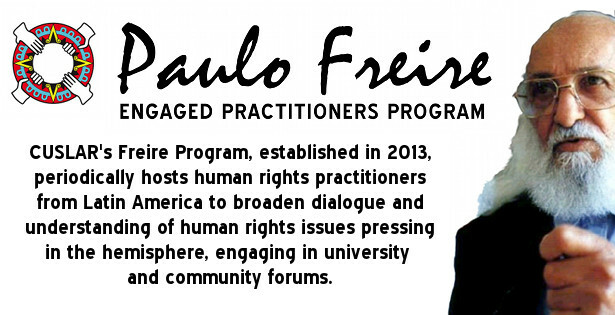 CUSLAR’s Paulo Freire Engaged Practitioners Program was established in September 2013 and periodically hosts human rights leaders from Latin America to broaden understanding and dialogue around pivotal issues. These practitioners share their experiences through lectures and dialogue with students, faculty and community organizations. Inspired by the pedagogical tradition of Brazilian educator Paulo Freire, the program is shaped by a human rights framework and allows students, faculty and local organizations to engage with leading Latin American practitioners in fields such as education, sociology, international and human development and political economy. In addition, the program is designed to support Latin American leaders in their pursuits of research and professional enrichment. The program seeks practitioners who balance intellectual rigor and social action and are able to spend time in the United States in dialogue and reflection. CUSLAR has hosted the following Latin American leaders under the Freire Program since 2013. Their stays have been as long as a month and as brief as a couple of days. Follow the links below to learn more about each leader’s contribution to the CUSLAR learning community. Judite Stronzake, activist and scholar, Movimento dos Trabalhadores Rurais Sem Terra, Brazil, 2013; Speech in English and Spanish. Estela Barnes de Carlotto and Buscarita Roa, activists, Abuelas de la Plaza de Mayo, Argentina, 2013; Speech in English and Spanish. Manuel de Alba, professor and filmmaker, Mexico, 2016. One ongoing element of this program is the Paulo Freire Study Group. The group meets regularly, either in preparation for the arrival of a practitioner, in direct dialogue with his or her writings and experiences, or as part of continuing engagement with human rights issues such as the right to healthy sustenance, decent shelter and quality public education. The Freire Study Group is also particularly interested in issues surrounding land tenure, food sovereignty and rural-urban networks in the Americas. CUSLAR’s inaugural Freire Engaged Practitioner was Judite Stronzake of Brazil’s Landless Workers’ Movement, whose month-long visit in September and October 2013 created space for more than two dozen speaking engagements and dialogues with university and community groups. Stronzake gave the closing plenary address at the Latin American Conference on Democracy and Dictatorship on September 28 at Cornell University and also spoke at New York University, Syracuse University, Ithaca College and Wells College. Stronzake is a member of the Landless Workers’ national coordinating body that provides a structure for the organization’s two million members. She is education coordinator for Latin America for the international peasant organization, La Via Campesina. She has been part of the MST since its founding in 1984 and has extensive experience in pedagogy, rural education and issues of agrarian reform and food sovereignty. In addition to an extended stay at Cornell University in Ithaca, New York, Stronzake visited the Poverty Initiative at Union Theological Seminary in New York City and the Media Mobilizing Project in Philadelphia, PA.
Local partners supporting the Paulo Freire Engaged Practitioners Program include: Cornell Engaged Learning + Research, Cornell Latin American Studies Program, Center for Transformative Action, The Dorothy Cotton Institute, Telluride House, Cornell Department of Development Sociology, Ithaca College Latin American Studies Program, Syracuse University and Wells College.